The deoxygenated blood returning from the body gets into the right atrium, which is one of the chambers of the heart. The 2 major veins, the superior and inferior venae cavae drain into the right atrium and all these are located on the right side of the body. All the blood coming from the left side of the body has to cross the midline in order to get to the right side of the body. There are a number of significant and quite large veins (several veins among these are in the thorax) performs this left-to-right shunting of blood in the body. In adults, the left brachiocephalic vein crosses the midline immediately posterior to the manubrium and produces blood from the left side of the head and neck, the left upper limb, and part of the left thoracic wall into the superior vena cava. 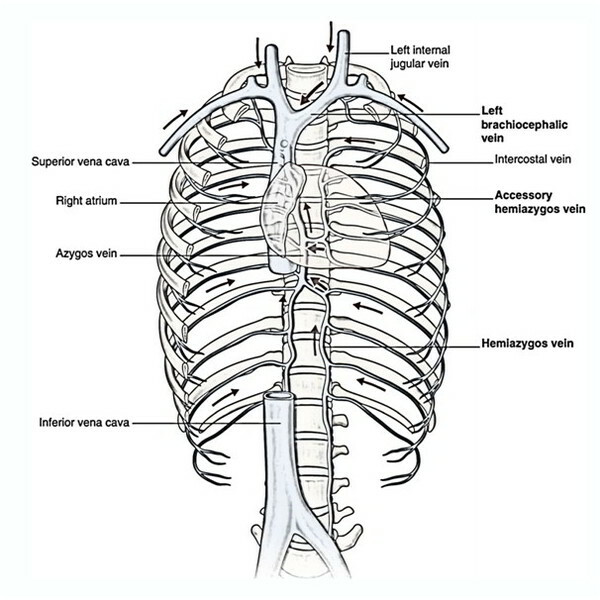 The hemiazygos and accessory hemiazygos veins drain posterior and lateral parts of the left thoracic wall, pass immediately anterior to the bodies of thoracic vertebrae, and flow into the azygos vein on the right side, which finally attaches together with the superior vena cava.